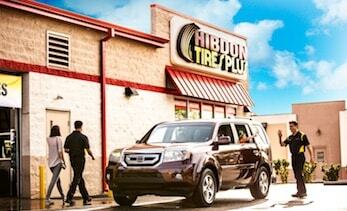 VISIT HIBDON TIRES PLUS YOU'LL BE BACK ON THE ROAD BEFORE YOU KNOW IT. Check out our tire offers for a selection of coupons on Bridgestone, Firestone and other leading brand tires. Explore our auto service offers for discounts on all kinds of services - like wheel alignment, brakes, batteries or oil changes. Our ASE certified technicians only use premium quality replacement parts for your repair services to ensure the job will be done right. Maintenance services, like oil changes & tune-ups, help prevent the effects of vehicle stresses, keeping your auto or truck fuel efficient and running smooth. *Discount cannot exceed $25.00. Valid at any company–owned Hibdon Tires Plus location. The subsequent second visit must occur within one year of the original service. This discount cannot be used to reduce outstanding debt.